Laughs provided by Parliament Hill? For real. James Gordon’s full-length musical play, Stephen Harper: The Musical, returns to the Comox Valley, May 16, refreshed and ready to deliver a stern—but funny—reprimand. After numerous successful sessions across the country in the past 18 months, SHTM has kept up to date with the repeat offences and growing shame of our nation’s capital. 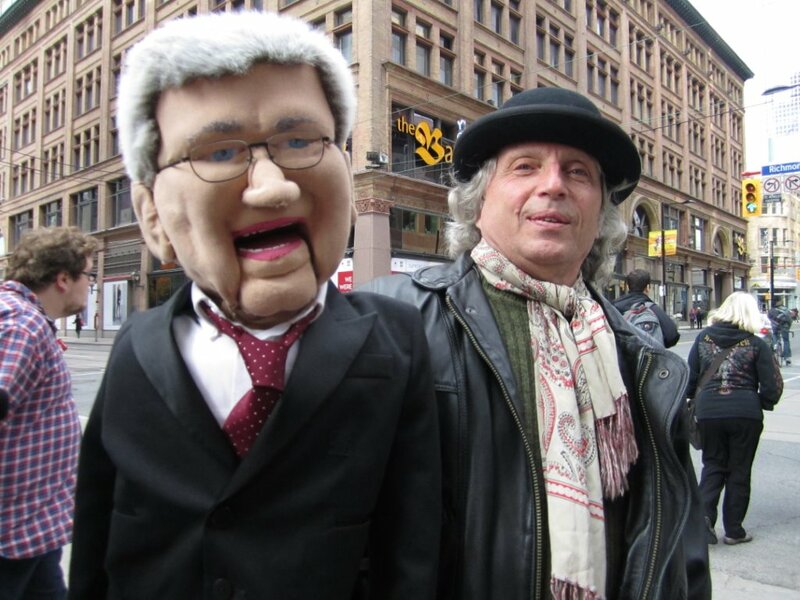 Originally written in 2013, this newly updated edition examines the current Canadian political climate through songs, rants, visuals, puppets… and a little bit more attitude. Gordon visited the valley in November 2013, playing two well-attended shows in Comox. The timing is right for this innovative (and entertaining) work. So many Canadians are feeling that their voice is not being heard under the “Harper Government”. What can we do about this? Audiences can find out, and have a fun theatrical evening at the same time! No matter what your stripes, there are laughs to be had – and maybe just a little swearing. Equally skilled as a playwright, using musical theatre as a vehicle for pointed social commentary, Gordon’s plays include “Hardscrabble Road” (about homelessness and globalization issues), “Nastee’ Business” (about the bottled water scam), and “Tryst and Snout” (a hillbilly adaptation of “A Midsummer Night’s Dream”). Gordon is a councillor in his hometown of Guelph, Ontario, and also ran for the provincial NDP seat in his riding. Presented locally by Comox Valley Council of Canadians, join them for one show only: Saturday May 16 at Cumberland United Church at 7:30pm. Come for a light-hearted evening of serious political satire. Bring a friend who’s on the fence. Bring teens who are on the verge of their first vote. Bring your sense of humour… and outrage. This entry was posted in Democracy, Events, News and Events by riverside11. Bookmark the permalink.